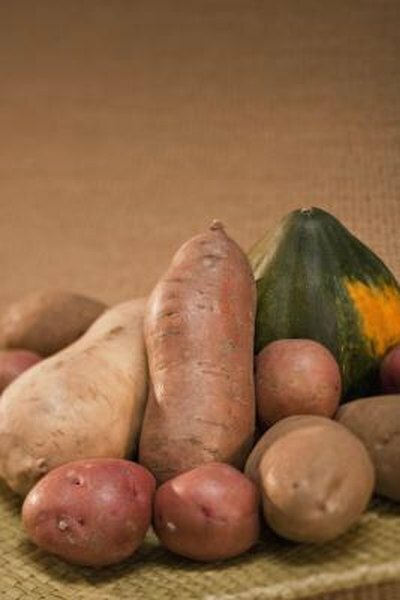 Sweet potatoes are a versatile vegetable, suitable for many preparations, but these tubers can also be juiced. The juice is savory rather than sweet, although apple juice is sometimes added to boost flavor. Several benefits are tied to drinking sweet potato juice, including enhanced eye health, disease prevention and treatment, and increased vitamin intake. Sweet potato juice is a rich source of vitamin A,, which plays an important role in the health of your eyes. This vitamin improves the surface of your eyes, making it more effective at repelling bacteria that can trigger infections. The vitamin A available in sweet potato juice also helps prevent dry eyes, age-related macular degeneration, peripheral vision loss and night blindness. Drink sweet potato juice, and you get a good source of vitamin E. This might be especially useful if you are diabetic, as a study published in the July 2011 issue of "Current Pharmaceutical Design" suggests that vitamin E intake might correlate to lower incidence of cardiovascular complications in diabetic patients. The vitamin E in sweet potato juice might also help curb asthma. Research featured in the July 2011 "Journal of Nutritional Biochemistry" indicates that vitamin E might prevent asthma attacks. Including sweet potato juice in your diet gives you access to quercetin, a phytochemical that might help prevent cancer. A study available in the July 2011 issue of the journal "Cancer Science" says quercetin stops the progression of tumors associated with skin cancer. Quercetin also has a positive impact on thyroid cancer, according to research published in the July 2011 edition of the "Journal of Korean Medical Science." The quercetin in sweet potato juice is good for more than just protecting you against cancer -- it might serve as a potential therapy for Alzheimer's disease. Research featured in the March 2011 "Journal of Pharmacy and Pharmacology" looked at the effect of quercetin on rats, which demonstrated improved memory retention; researchers theorize quercetin might figure into a future treatment for Alzheimer's.